Dentistry prof introduces fishy research to Bannatyne campus. AS A DENTIST in her home country of Sri Lanka, Dr. Devi Atukorallaya treated many children with cleft palate and cleft lip. She wanted to understand how such facial malformations develop before birth. In 2007, when she arrived at a Japanese university to start her PhD research, she was greeted with startling news. Atukorallaya overcame her reluctance and dived in. 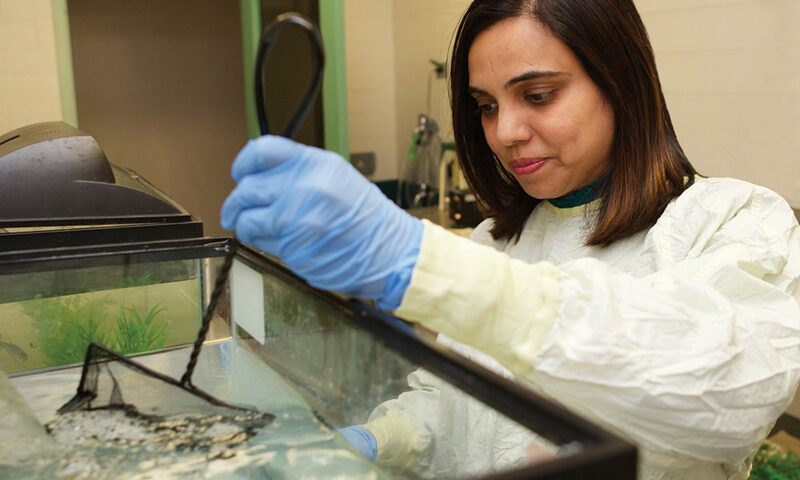 The study of embryonic tooth, jaw and head development in certain fish – and how it surprisingly applies to humans – has become her passion. It brought her to Halifax in 2012 as a postdoctoral fellow, and to the U of M in 2017 as a new assistant professor of oral biology in the Dr. Gerald Niznick College of Dentistry. “The face of a fish and the face of a human are very different,” she says. “But in their very early development, like in a one-day-old fish embryo and a three-week-old human embryo, how the bones and other organs form is very similar. The genes behind these development mechanisms are 70 to 80 per cent the same. Biomedical researchers throughout the world use zebrafish as models, the professor says. At Mount Saint Vincent University in Halifax, she was introduced to Mexican tetra fish, a species that’s only being studied at a few universities. 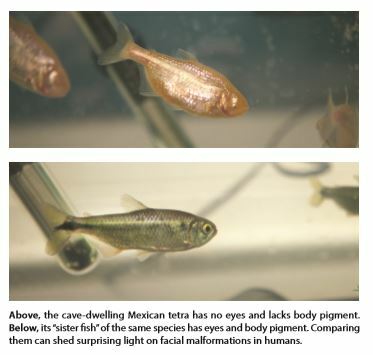 The Mexican tetra species is of great genetic interest because it has evolved into two types that can be compared: pinkish-coloured cavefish that have no eyes and lack body pigment because they live in darkness, and surface-dwelling fish that do have eyes and body pigment. In November 2017, Atukorallaya took delivery of six of the blind cave type and eight of the surface type as breeding stock to establish her U of M colony. They’re believed to be the first-ever fish models on the Bannatyne campus. They were a gift from an expert at New York University. “You can’t buy them commercially because you have to know their genetic lineage,” says Atukorallaya. She has also received zebrafish for breeding stock from the University of Toronto. She describes experiments such as adding fluorescent dye to larval fishes’ water. Absorbed through the gills and mouth, the harmless chemical glows under the microscope, allowing Atukorallaya to trace the development of the creatures’ bones and teeth. The professor has several research projects underway. With a $30,000 grant from the Manitoba Medical Service Foundation, she is examining how a skull bone in zebrafish can provide insight into cleft palate in humans. Certain groups of proteins, she says, are required to form a normal palate. By conducting genetic experiments on these proteins in zebrafish and observing the fishes’ palate formation, she’ll obtain data that could aid in earlier detection of cleft palate in human embryos. With a $125,000 grant from the U of M Start-Up Fund, Atukorallaya is studying skin organ development in both zebrafish and tetra fish. “I’m going to see how their teeth, scales, mucous glands and other glands normally develop, and what happens when their genetic pathways have mutations,” she says. And with further U of M funding support, she is analyzing the genes and cells responsible for forming the bones of Mexican tetra fish. The Mexican tetra fish – close relatives of the piranha – are also fascinating to oral biologists because they can grow and shed up to 40 sets of teeth during a lifespan of eight years or more. Genetic understanding of tooth regeneration may help pave the way for dental patients of the future to grow new teeth, the professor says. Atukorallaya hopes her research contributes to finding alternatives to costly surgery – perhaps prevention or treatment in the womb – for cleft palate and other craniofacial abnormalities. The scientist, whose husband and two children have settled with her in Winnipeg, has come to view her fish models with awe and respect.